Spicy Vegan Buffalo Chickpea Wraps, with crunchy romaine and tangy ranch! Happy Friday!! I haven’t been posting for a few weeks now and I’m super excited to be back. As most of you know, I was hacked in March, and I’ve had some technical difficulties since then. Things are definitely on the upswing, but having issue after issue just kind of gets to you, you know? 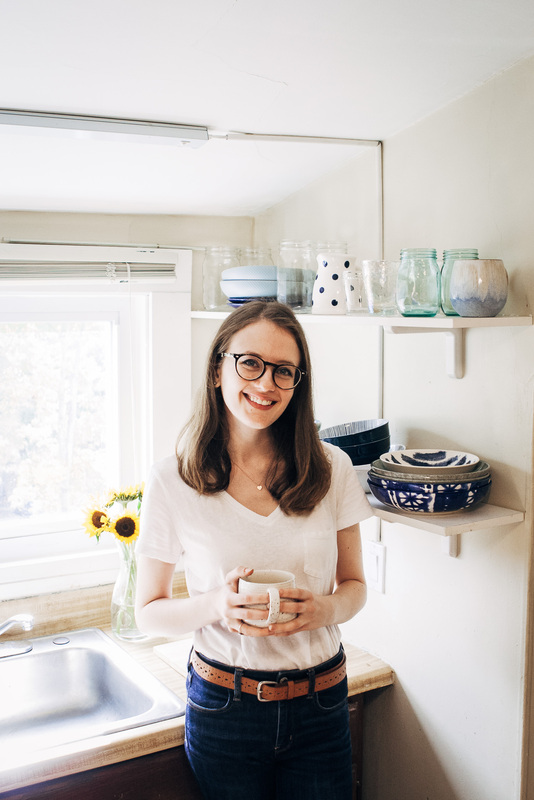 So I’ve been taking a more chill approach to blogging. 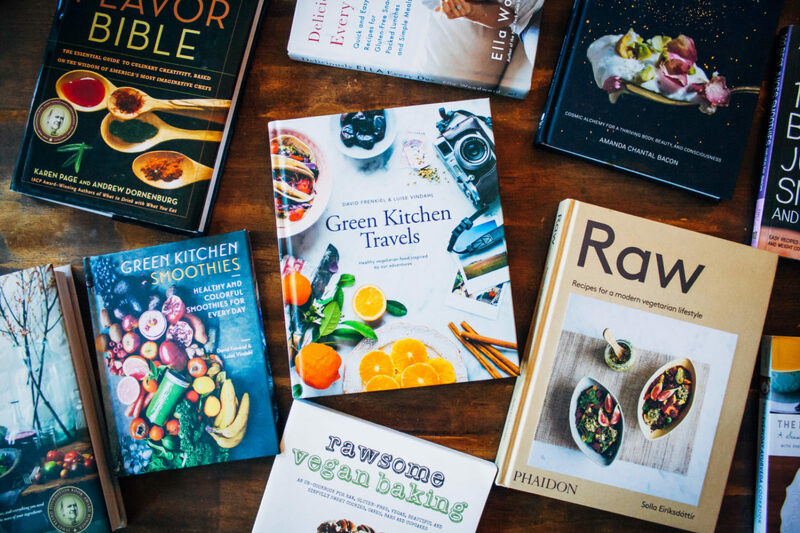 Not so regimented or structured – just posting when there’s a good recipe to be shared. Summer’s also here too, so it means that more people are going to be out having fun instead of reading food blogs! I, for one, have a lot of things I want to do this summer – I’m training for this big hike I want to go on in the fall, and I’m scouting out some places I can go camping with my dad. My dad is really big into camping, but the challenge is getting him to take time off of work to go. He runs his own business, so everything is kind of on his shoulders. But #YOLO, right, so I’m definitely going to be pushing for some trips this summer. Let’s just hope he doesn’t try to bring along the Camp Suds he’s been holding on to since the 1980’s! As I’ve been riding the waves of the changes life’s thrown at me the past couple of months, I keep feeling this overwhelming urge to get off the grid and go have adventures. I’ve been to a couple of National Parks out west but there’s just so much I want to see. I feel like when you’re outdoors, surrounded by Earth’s beauty, all of the mundane problems of life just slip away. In the end, it doesn’t matter what car you drove or how your house was decorated or what clothes you wore. All of these things are transient. Life’s really about the experience; it’s about the relationships and how much you loved. That’s all you can take with you. That’s enough musing for today, on to the recipe. It’s kind of a crime that this is my first recipe containing hot buffalo sauce. It’s because I LOVE buffalo sauce, and I eat it with pretty much everything. I just love spicy food in general (if you haven’t noticed from the recipes over here)!! 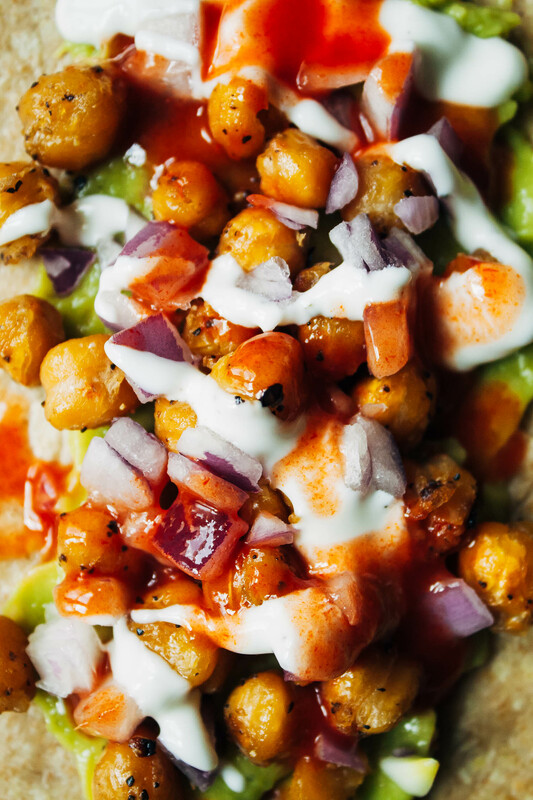 What makes this wrap different from other vegan buffalo chickpea wraps is the fact that you dry roast the chickpeas with salt and pepper, and THEN add on the buffalo sauce – making sure the chickpeas stay meaty and slightly crispy. Add on some gauc, a little ranch to cool things down, and some veg – perfection. I hope y’all love this recipe!! 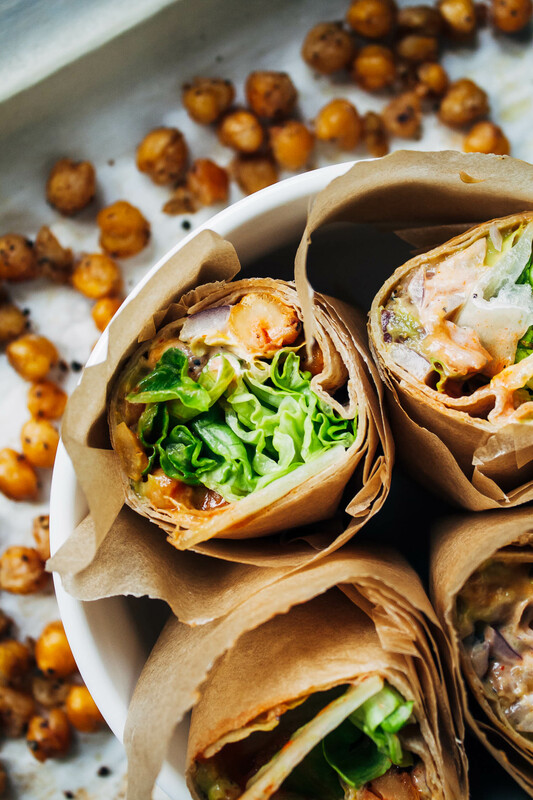 These vegan buffalo chickpea wraps are perfect for lunch, with salt + pepper chickpeas, guacamole, tangy ranch, and hot buffalo sauce! Rinse and dry the chickpeas so that they're totally dry. Remove any loose skins if needed. In a bowl, mix chickpeas with olive oil, salt, and pepper. Mix well until chickpeas are evenly coated. 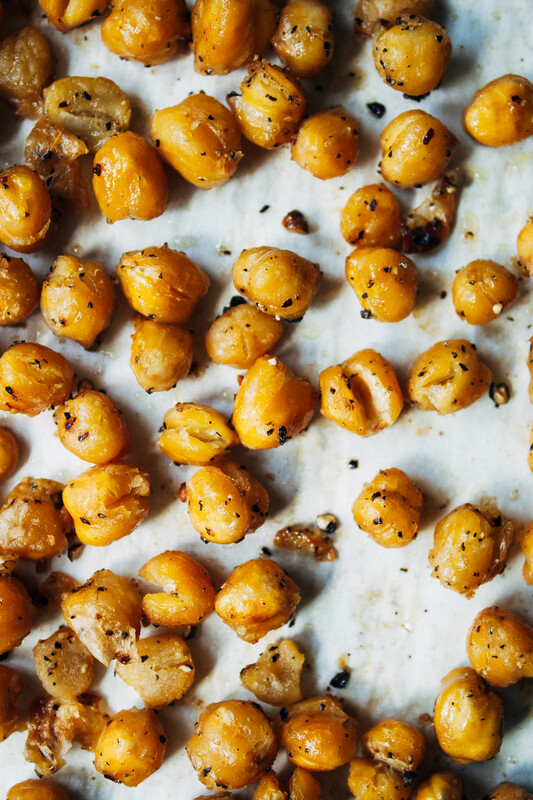 On a baking sheet lined with parchment paper, bake chickpeas for 20-25 minutes, or until crisp. Once chickpeas are slightly cooled, assemble the wraps. Take 2 tortillas or wraps, and spread the guacamole on them. Add on the chickpeas and red onion, and drizzle with a little vegan ranch and as much buffalo sauce as you like. Then, add on as much romaine as you like. 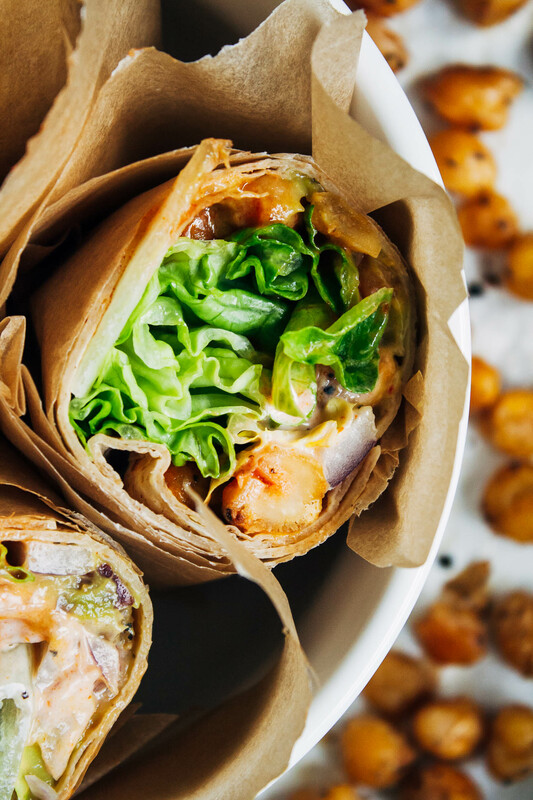 Wrap up the wraps and serve. I LOVE adding buffalo wing sauce to vegan recipes-it’s like a throw back to my old, wing-loving self. 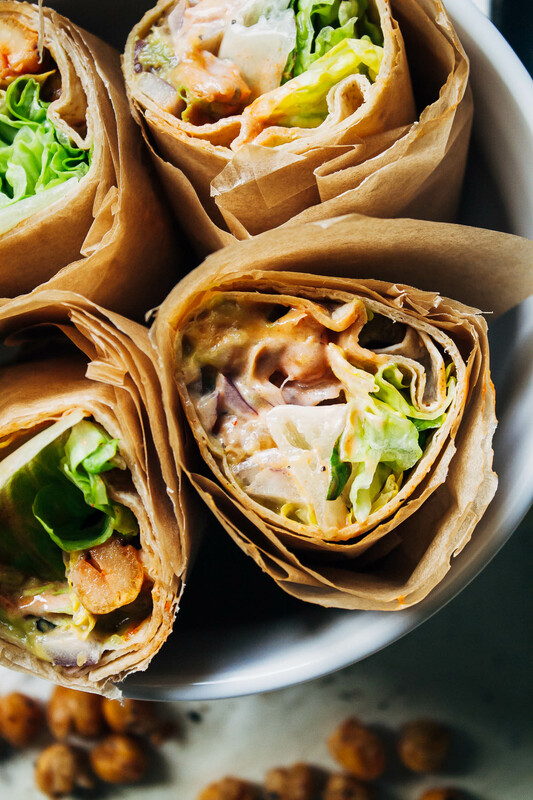 This combination thrown into a wrap is such a tasty idea to merge pub-style + health food. Yumm! Thanks for recommending a good Buffalo Sauce! I’ve been meaning to find a new favorite. Could not agree more on your yearning to get to have off the grid adventures!! I got into backpacking (18 years – ahh!!) ago and I HIGHLY recommend! You are able to get away from a lot of the activity of the busiest sections of the parks (national and state) and enjoy some sweet solitude. (With you and your sweet company of course!) I hope you share were you adventure on the blog! Love creating recipes with chickpeas, in fact, I keep chickpeas in my pantry at all times. Thanks for this awesome and I’m sure delicious recipe. Glad to see you back here! And your Summer plans sound awesome, enjoy it to the full! I’m also planning spending as much time outdoors as I can (UK weather permitting!). You have to try buffalo sauce, it’s so good!! :D Thanks, Anna! This is pretty food and I’m sure pretty good to eat. These would be great to make for game day gathering, wrapped the way you have them it’s the perfect self-serve. I also like spice, I have to have cracked black pepper on just about everything I eat. We used to have a ton of difficulty about getting away to go camping, but we decided that since we live in the PNW and there is somewhere to go in every direction, we don’t have excuses. First of all, your photography is lovely! Second, I’ve never tried buffalo chickpeas but it sounds tasty! I’m always on the lookout for anything with buffalo sauce, and this is a great way to be a bit healthier. Great job!